"Donlen’s interactive Report Builder was designed for fleet professionals to satisfy their reporting needs at all levels of their business," said Jeff Pursell, vice president, technology products. "Reporting examples include executive summary fleet trends, exception-based driver issues, and web service subscriptions to provide immediate integration with internal systems." Our new, intuitive reporting dashboard provides a one-stop-shop for fleet professionals to access, search, and view their latest-run reports, suggested reports, and report subscriptions. With all of your reports neatly organized on one dashboard, all of the fleet data you need to manage your day-to-day fleet operations is just a couple of clicks away. Only at Donlen can you get true real-time data access with more than 500 data reporting fields to manage your fleet quickly and efficiently. 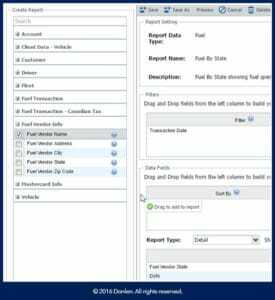 FleetWeb Intelligence Reporting provides a simple-to-use way of creating and organizing reports on one screen using that data. With our interactive report builder, you can fully customize your reports using drag and drop data fields, create detail and summary reports, and preview your reports as you build them. You can also view suggested reports from Donlen, and customize those reports in any way to suit your fleet. You can choose to create either summary or detail reports, or modify existing reports. With more data fields, filters, and settings available to you, you will be able to make your data work for you by sorting, organizing, and drilling down data to find exactly what you need quickly and easily. Once you have built your reports, you can easily set up report subscriptions and customize those subscriptions based on delivery method, delivery format, and frequency. You can choose to have your reports sent directly to you either via email, online, or through simple data integration with Application Programming Interface (API) output, ensuring you always have the specific data you need when you need it. “Our report builder is truly best-in-class with access to over 500 data points and the ability to create customized summary and detail reports," said Pursell. "Donlen’s technology makes it easy for fleet professionals to manage their fleet." Managing your fleet’s data doesn’t have to be overwhelming. Access and organize all of your fleet’s data based on your unique fleet’s needs with the new FleetWeb Intelligence Report Builder from Donlen, and get more done. Want to learn how you can harness the power of FleetWeb Intelligence Report Builder?